The XL1 is the latest in VW's 1-litre car strategy. The aim for the 1-litre strategy is to develop a practical car that will use only one liter of fuel to travel 100 km -- equivalent to 240 miles per gallon. This amazing latest version carries two adults in side by side seating. The latest prototype can go 100 km on 0.9 liter of gas -- 260 mpg! The car accomplishes amazing fuel efficiency through low weight, very low aerodynamic drag, and a very efficient diesel/hybrid power train. The low weight is accomplished in part through the use of a carbon fiber composite body. Advanced materials are used in other areas to reduce weight, and the seating for only two people no-doubt also helps. The empty weight of the XL1 is 1750 lbs -- and this includes the battery pack for the hybrid power train. The low aerodynamic drag is accomplished through a combination of a very low drag coefficient and a low frontal area. 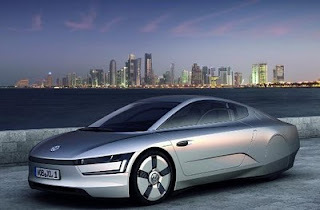 The XL1 has a frontal area of 1.5 sm and a drag coefficient of 0.186. Compare this to a VW Golf with a frontal area 2.22 sm and Cd of 0.312. The drag force is proportional to the product of frontal area and drag coefficient, so the XL1 drag force at any given speed will be about 40% of a Golf. Much of the frontal area reduction is achieved by reducing the height, which must make for an interesting seating position. 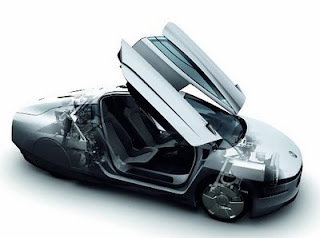 The car is powered by the combination of a 0.8 liter turbo charged diesel engine and a 20 KW ( 27 hp) electric motor. The The car is a plug in hybrid, and can run on electricity alone for up to 22 miles. The engine was derived directly from the current TDI VW engine. All the information above is derived from the VW press release, which I suppose is fluffed up a bit, but even allowing for some VW optimism, the car is an amazing accomplishment. It shows the synergistic effect that applying a whole range of technologies to a new design can bring. Just think of the impact that widespread use of this kind of design could have.